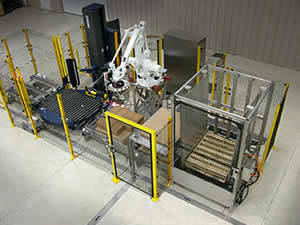 QComp Robotic 5G Compact Lean Palletizer stacks bags, cases or trays. QComp’s 5G Compact Lean Palletizer is the latest addition to QComp’s line of palletizers. The 5G Palletizer will stack bags, cases or trays at your point of production, eliminating long and costly conveyor runs to centralized palletizing areas. The palletizer features a durable, robust robot that boasts a picking rate of up to 20 picks per minute. What makes the low cost pre-engineered 5G Palletizer especially attractive is its compact modular design which frees up valuable floor space, decreases installation time and saves money, resulting in a fast Return On Investment. Robot handles loads over 100 lbs.